What are declarations? Scripture (Proverbs 18:21) teaches that life and death are in the power of the tongue. 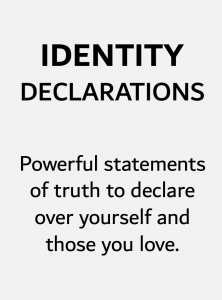 Declarations are intentionally speaking Scriptural truths aloud over our lives, workplaces, neighborhoods, cities, family members, etc. Your faith, hope and joy will rise as you declare these powerful truths over yourself, your family, your city and your workplace! 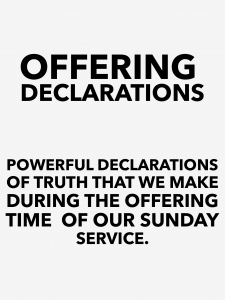 Have a testimony of how declarations are changing your life? We’d love to rejoice with you! Send your testimony in today! Extreme hunger for God, new revelations, thoughts and ideas. Courage, wisdom, discernment, and knowledge of how to lead your people. Unity among the young and old. I am a great communicator! My relationships are strong because I have cultivated a freedom from the fear of confrontation in my life! I value relationship above the pain or inconvenience of confrontation! I joyfully embrace opportunities to resolve conflict with others! WLC is a magnet for signs, wonders, and miracles! Salvations, Healings, and Deliverances are a normal part of life at WLC! WLC overflows with God’s love, making it impossible for us not to love others! WLC is rich in love and finances making it possible to do what God has called us to do for our community! I am made in the image of God! I was planned and designed with a purpose! I have a powerful destiny and I’m equipped with all that I need to see it fulfilled! I am firmly anchored in my Father’s Love! Stratford is God’s city. He is moving powerfully in Stratford through me! Stratford is a destination city! People from all over the world will travel here because they are attracted to the presence of God in Stratford! God has chosen Stratford as His resting place! He loves blessing the people of Stratford! I am growing daily in my character, integrity, love, organization, communication, and leadership! I am committed to a life-long personal growth plan! I am a catalyst for personal growth in others! As I focus on Jesus and spend time in His presence, I am being transformed into His likeness! WLC is here to impact this community with the goodness of God! WLC is a destination stop for visitors to Stratford! WLC is a campus for people to find Jesus and receive radical encounters! 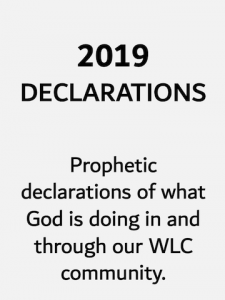 WLC makes decisions that bless the people of Stratford and expand God’s Kingdom on the earth! I encounter God’s love and power every time I am in His Word! I have strong motivation and spiritual hunger to spend time in the Bible! I claim and receive the promises of Scripture for my life and for my descendants! It’s impossible for me to spend time in God’s Word and not be radically transformed! Every business in Stratford prospers financially! Raises, bonuses, and promotions in Stratford! The residents of Stratford are generous people and they love to lend to their neighbors! All mortgages and taxes are paid in full in Stratford! I am a glory-carrying child of the King! I bring people into encounters with Holy Spirit everywhere I go! I am a generous giver, beyond my mind and current understanding! I am blessed and highly favored, therefore my workplace is blessed and highly favored because I am in it! Favor for our city with CEO’s and government leaders! Manufacturing firms that produce goods for the nations and provide new jobs for our people. Technology to establish new markets, energy sources, and efficient solutions to grow as a population. Laws & Courts that measure with the justice and the freedom of our land’s Constitution. This is the year of restoration! What the enemy tried to steal, God is restoring 100 fold! The years the locusts have eaten are being restored! Divine health and favor are all around me! The people of WLC are anointed to restore the broken-hearted and set the captives free! WLC chooses to love people into wholeness. WLC is permanently tapped into Heaven’s infinite supply of love. WLC is filled with a tangible peace. When people walk in, they immediately feel at ease and calm. My body is under supernatural protection! I am a magnet for healing, and people around me constantly get healed! I am immune to sickness and disease because I am a new creation with new DNA! I am living in ever increasing health. My eyes, bones, hearing, central nervous system, organs, and muscles get stronger and stronger the longer I live. WLC family connections are going deeper and becoming more significant every day. WLC members are great decision makers whose choices bring health and prosperity to them and their descendants. The best seasons of WLC family are ahead. WLC walks in ever increasing revelation of the goodness and love of God toward us. My mouth establishes praise to silence the enemy! Everywhere I go becomes a perfect health zone! I was designed for worship! WLC is a magnet of God’s favor. People are drawn to WLC. Families are being restored and transformed at WLC. There is standing room only at WLC because so many people are attracted to the presence of God. Civil servants that encourage entrepreneurs. Media known for wisdom and truth. Education, books, Universities that develop mind-molders who influence the influential. Capital to build small businesses that provide services, arts and culture, attracting both young and old. I am powerful, and what I believe changes the world! I am a carrier of God’s Holy Sprit, anointed to heal the sick, raise the dead, transform cities and disciple nations! I was made for such a time as this! No weapon formed against me will ever prosper! Large finds of gold, silver, diamonds, and pearls. Prophetic dreams and visions that release encounters to others. More than enough financially to impact this community for the Kingdom of God. Angelic visitations that change lives. This is the year of salvations! Many will come into the Kingdom through my life! I am a conduit of the presence of God! I am a peace maker! Medical community known for integrity and excellence. Repentance from poverty, small thinking, and envy. Courage to recognize opportunities and wealth. Revelation to pass on wealth to our children’s children. My joy & laughter are powerful weapons of spiritual warfare and help create breakthrough in my own life and the lives of those around me! I am an outrageously joyful person! I am a carrier of infectious joy, and I release joy to others! I am building a stronghold of joy in my life! Demonic assignments broken and lives mended. New leaders being raised up to carry revival fire. I have the mind of Christ and I use it! I am clothed with Christ, therefore I release His presence everywhere I go! I think and speak prophetically! It is impossible for me to pray and have nothing happen! As for me and my country, we will serve the Lord. Our nation is full of people of principle. Our nation loves truth and integrity more than money, fame, comfort, or success. Our nation is known for our passion and love for each other. My hands are anointed to heal! Healings break out everywhere I go! I am a magnet for favor! Favor is attracted to me and all those around me! I am all-in! It is my joy to give up my life to find it! I hear God’s voice. I see what He sees! And it is easy for me to translate His words to others! WLC and our community have an ever increasing relationship. Stratford leaders come to WLC for wisdom and guidance. Every church in Stratford works together to release more of the Kingdom of God into this community. Every business and school in Stratford ask for prayer from WLC. I give grace generously to myself, and to those in my family! I am generous with my love, patience, and kindness! I am on a generosity rampage, seeking whom I can bless next! I overflow with delight as I generously give to the Lord and to others. God has given the governmental leaders of Stratford extraordinary wisdom, understanding, and knowledge. They have divine strategies and ideas to lead this community. Mayor and counsel think clearly, quickly, and with God’s heart in every matter. They release God’s agenda over Stratford. Our nation is a generous nation that loves God and man. The leaders of our nation are servants and know Jesus intimately. Our nation is blessed financially and it’s leaders have divine wisdom and insight when making decisions about finances. God is using family relationships in significant ways to impact the world. I am fearless, courageous, and I live with an understanding that people are hungry for Jesus! I am creative in my evangelism, and I adapt well to bring powerful God-encounters to different kinds of people! Today my mind and spirit will tune into the people around me and find those who desire to be saved. I will lead those people to Jesus! We declare and decree that this is the year in which God has heard our cries for mercy and things are turning around. We speak the opening of heavenly gates and ancient doors that will bring us into deeper relationship with You, God. We decree a time of renewing our strength and soaring in Your presence, God. We agree with the “new things” that will bring spiritual refreshment to those who have been in the wilderness. We declare a new day as God’s light shines on and through us. We declare that the times of spiritual hopelessness and disappointments have come to an end. This is a year of sudden good breaks. We gladly receive any pruning needed in our lives in order for us to remain in you Lord. We decree that we will step into a place this year to have greater authority to see answers to the things we ask for in prayer. We declare and decree that we will live our lives this year above all the negativity around us. We look for doors of opportunity and ask for eyes to see all that you are doing God. We are in agreement with God’s promises to pour out His Spirit on our descendants and declare that we will see them grow fast and strong. I am a glory-carrying child of the King! I bring people into encounters with Holy Spirit everywhere I go! I am a generous giver beyond my mind and current understanding! I hear God’s voice. I see what He sees. And it is easy for me to translate His words to others! This is a year of abundant grace to joyfully and expectantly wait for God’s promises, submit to His character shaping in my life and to receive all He has for me! This is a year of extravagant healing – of body, mind, and soul! This is a year of increase in miraculous healing, testimonies and supernatural power! I will walk out in faith with every promise God has given me! I will share the Good News of Jesus at home, at work, in the community and everywhere I go! We declare an abundance of people and finances! We declare freedom from addiction for extended family and immediate family! We declare families restored and prodigal sons returning. We will see salvations and more divine appointments at work. We are bold, courageous and have no fear! We will take more risks in faith. We will have increase in visions, hearing Holy Spirit’s voice clearly, and supernatural encounters! I choose child-like faith for how God will provide all of my needs in every season! I am loved unconditionally. And I love unconditionally! I choose to keep my love on in every situation! My voice is powerful and God wants to speak life-giving words through me! God is discipling the nations through my life! God’s love in and through me changes every atmosphere! God is always in a good mood. Jesus is our Victor. Faith is our victory. Great is God’s faithfulness in supplying everything we need! Jesus is more than enough, so I am more than enough as I depend on Him. I choose honor in every situation! Every seed planted will grow into a beautiful harvest. I am created to change history and God will use us to heal our land! We declare that we are ALL-IN! I am a child of God. He knows me by name. I am unconditionally loved and lovable. I am visible; I am seen and I belong. I am uniquely designed, talented and gifted. I am strong, courageous and bold. I am a giant-killer, fearless and full of hope, joy and peace. My hands are anointed to heal. I am called of God. I encounter God by faith. I do everything in great faith. I apply great faith to everything I do. I am free from fear. I am not afraid of missing out. I lay down my life for others. I love to serve my family. I am igniting by a burning vision. My mind is being renewed by the word of God. I am first a worshipper. *For many more powerful declarations, we encourage you to check out resources from Steve & Wendy Backlund at ignitinghope.com. Who are you? Child of the King! Who is in you and who is upon you? Holy Spirit! For what purpose? To change history! What’s your mission? To bring Heaven to Earth! 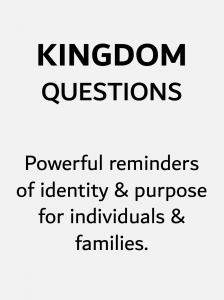 *idea: incorporate these Kingdom Questions in conversations with your children/family in the car, before bed, at dinnertime, etc. We declare and prophesy into the nations and into the world for a thousand times return in saved souls, neighborhoods healed, families restored and nations turning to Jesus. 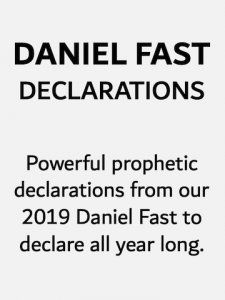 We declare increase and favor in all areas: physical health, mental health and soul health, increase in finances, raises, bonuses, promotions, refunds, checks in the mail, rebates, generous gifts, large finds of gold, silver, diamonds and pearls. We declare death to being in debt and God’s favor for a supernatural increase to obliterate debt in families, cities and nations.We hereby sow seeds into the Kingdom and as we are blessed, we return with more for the storehouse of God to sow and build into the Kingdom of God. Today I choose to give, tithe, offer with intense joy and satisfaction.My heart rejoices as I give back to the King, into the storehouse of God, the church. I am rejoicingly aware of my sowing into the Kingdom with results of Biblical proportion.I give with the expectancy to bring Heaven to Earth. So I declare favor, increase, blessing, answers to questions, mighty revelations, dreams, visions, revival awakenings, financial increase, salvation for homes, cities & nations. Eyes opened, hearts set free, ears hearing, hearts transformed, belief systems reconciled to God, creative destiny and purpose realigned to God’s original creation plan. I declare that God is good and is a rewarder of those who earnestly seek Him!He is a great Father and I am his son/daughter. His love for me is unconditional, unsearchable, unbiased and endures forever!He gives in abundance of overflowing.His plans for me are always good.His thoughts toward me are always full of love.He rejoices over me with joyful songs. Because of His great love, I will not be moved; I will not be shaken. No weapon formed against me will ever succeed. I am a conqueror and a beloved child of the King! I am empowered, strengthened, purposefully designed and strategically placed right where I am to impact the Kingdom of God, bringing heaven to earth, spilling God’s favor, good news and goodness to all nations covering the earth!